Members of the Hardin Northern Class of 1958 include (front, left to right) Dorthy Frederick James, Nelda Knauff Adcock, Floyd Crowe, Janet Lambert Hensel, Dianna Steinman Starr, and (center, left to right) Charles Thomas, Joe Smith, Barbara Willeke Haynes, Phyllis Powell Griffith, Janice Bailey Rausch, Sally Gibson Miller, Judy Tow, Leota Fierabend McCandless, Pat McCann Fisher, Marilyn Hiller Amweg, Louise LaRoche, and (back, left to right) Laverne Freed, Charles Hensel, Ron Arn, Rowe Garmon, Bob Temple and Lester Miller. JoAnn Wertenberger Carman and Jim Sampson were also in attendance. MT. 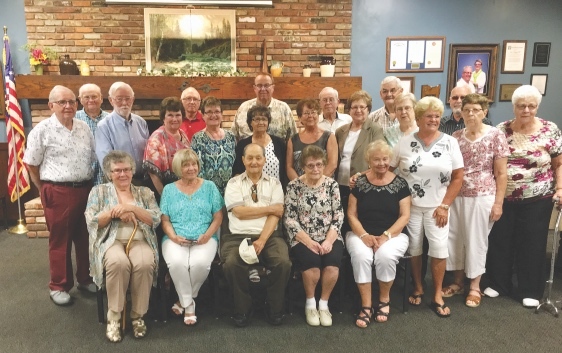 VICTORY — The Hardin Northern Class of 1958 met recently at the Plaza Inn, Mt. Victory to celebrate 60 years. Twenty two members of the graduating class, three other classmates, and eleven guests attended the reunion. A buffet luncheon was served and everyone enjoyed the afternoon. Dianna Starr shared a poem she had written in remembrance of three classmates who have passed since the last reunion: Elinor Kindle Laing, Kaye Bernhardt Claphan, and Bob Nickell. Photos of eight deceased classmates and class memorabilia were displayed. Louise LaRoche shared a humorous reading. Classmates came from Oregon, Montana, Virginia, Michigan and throughout Ohio.